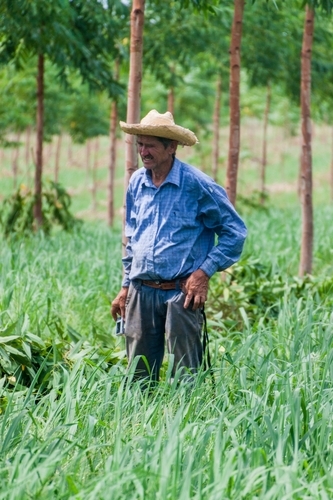 “Close to Nature” Planted Forests (CTNPFs) have the potential to provide not only environmental but also economic and social benefit in Latin America. At present, little is known about the growth and silvicultural behavior of native species planted in isolation or in combination, nor about the financial, environmental, and social costs and benefits, although this information is crucial for the design of public policies to incentivize planted forests that are more sustainable and resilient. Furthermore, if combined with efficient incentive schemes (Conditional Cash Transfers, CCTs, for example) such programs can have a significant impact on rural poverty. The Secretariat of Planning of Paraguay, which is in charge of the government’s Social Protection Program (Tekoporá; Sembrando Oportunidades), has proposed combining CCTs with forest incentives. Thus, in order to assure the sustainability and resilience of planted forest, this activity proposes to incorporate the CTNPF approach into Paraguay’s national reforestation plan to safeguard national and global public goods by giving appropriate attention to social and environmental functions in addition to productive and conservation functions. Identify examples of CTNPF in the tropical and subtropical region. In collaboration with the FAO, possible sites will be identified, of which six cases where substantive technical, financial, and economic information is available will be documented and analyzed. Produce a compilation of the case studies, a comparative analysis, and a policy brief. In collaboration with the FAO/Bank Cooperative Program (CP), the analyzed case studies will be compiled, analyzed, and summarized in a policy brief. Organize a South-South learning and exchange event among policy makers, CTNPF practitioners, experts, planners, private investors, forest policy specialists, and financial decision makers. Streamline CTNPF principles into national afforestation programs and/or establish demonstration CTNPFs in participating partner countrie. Dissemination of findings, targeted at public opinion leaders, policy makers, ministries responsible for planning and forest management, and to training/academic institutions. Argentina, Corrientes Province: Private comercial venture GMF/Novartis. Sto.Domingo Plantation 3,404 ha. Combinations of fast growing exotic Pinus and Grevillea sp. with 16 native species (including Peltophorum, Tabebuia, Pterogyne and Cedrela). Ecuador, Pichincha Province: NGO Bosques para la Conservación, 54 ha. Combination of 10 native species including Alnus, Cedrela, Oreopanax, Myrica, Podocarpus, Junglans. Ecuador, Orellana Province: Plywood Industry Arboriente. Palmar del Huino Property 1300 ha; 22 ha combination of native speices inluding Cabralea, Parkia, Vochysia, Cedrelinga, Hyeronima and Matisia. Paraguay, PROEZA. Sustainable Livelihoods for small farmers and indigenous communities. Technical, financial and economic feasibility of four CTNPF Models: i.) Eucalyptus with native species combinations (20% and 50%), ii.) Natural Forest Regeneration Management, iii.) Mate grass cultivation combined with SFM, iv.) Native Tree species combined with Mate or Citrus cultivation. Paraguay, PROEZA. NGFP modells for medium scale investors. Forest plantations for biomass, quality timber and meat (silvo-pastoral) production; in combination with restoration of riparian and protection forests with native species. Results informed the PROEZA Project design, which was funded by the Green Climate Fund in early 2018. The PROEZA project links social protection with environmental incentive payments. FIndings were also shared with forest policy makers in Argentina, Brazil, Paraguay and Ecuador. In April 2017, the President of Paraguay issued a Presidential Decree creates the compulsory “Forest Reserve” mandating that land owners that have more than 25 ha in “forest zones” and who have not reforested 5 percent of their property have to reforest that percentage, or alternatively, buy Environmental Services Certificates (ESC) to compensate this deficit. Both instruments introduce the concept and definition of CTNPF, “Bosques Plantados Multifuncionales” into the Paraguayan forest normative framework as a means to compensate legal reserve deficit also through CTNPF establishment. In 2018, the Government of Argentina will be proposing a restructuring for the IBRD Forest and Community Project (P132846), which will include a forest restoration component. In April 2017, the concept and experiences of CTNPF initiative was shared with forest stakeholders and Environmental Secretariat of the State of Sao Paulo, sharing knowledge with the PROFOR supported activity Mechanisms to incentivize the re-establishment and scaling up of native species forest plantations in the State of São Paulo, Brazil.